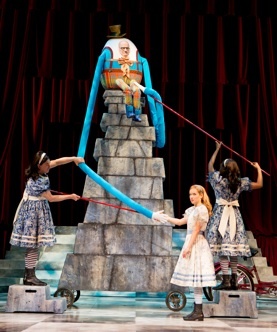 As part of its commitment to staging at least one child-friendly show per season, Stratford’s new production of Alice Through the Looking-Glass is a vast improvement over last year’s dismal Three Musketeers. Unlike Musketeers, Alice is based on a famous book written specifically for children and it is given a bright, incredibly imaginative staging by director Jillian Keiley and designer Bretta Gerecke. The show does still have the inherent problem that it will likely appeal to the parents of accompanying children more than to children themselves. This is because what Lewis Carroll assumed children would know in 1871, when Through The Looking-Glass, and What Alice Found There was first published, is quite different from what children are expected to know today. The story, too, though filled with colourful characters, is essentially undramatic. When Stratford first staged James Reaney’s adaptation of Carroll’s novel in 1994, many were surprised that Reaney followed Carroll with such dogged page-by-page precision that there was no evidence of his own dramatic style or of the choral storytelling techniques he used in such works as his Donnellys trilogy. When Alice steps through the looking-glass into the alternative world on the other side, she sees it is laid out like a gigantic chessboard. She meets the Red Queen who tells her that if she can move to the eighth row, she can be a queen, too. That is the entire plot. The book and play consist of a series of episodes as Alice moves from square to square, but, unlike Alice in Wonderland (1865), there is no suspense or danger. There is no character she is trying to catch up with like the White Rabbit, no threatening figures like the Queen of Hearts and no trial like that of the Knave of Hearts. What we have is merely a sequence of episodes where Alice meets various strange characters, some of whom recite poems, before she leaves them and meets more strange characters. For adults, the interest in the show is to see a familiar work on stage. For children, it will be pretty much like watching a colourful parade go by that has no story to follow or get caught up in. Carroll’s Alice books are particularly famous for paradox and nonsense. The evocative but made-up words of his Jabberwocky poem are a perfect example. one way or the other, do not have this notion. The Stratford website reckons the show is suitable for ages 6 and up, but the 6-year-old sitting in front of me kept asking her mum “What’s happening now?” which I thought a fair response to the action on stage. What adults find delightfully mind-tickling to children can be just confusing. If children understand chess at all, they will see Alice move unopposed from square to square until she becomes a queen. To make this interesting designer Bretta Gerecke has created some of the most fantastic props and costumes seen at Stratford. In the looking-glass world, Gerecke has placed a chorus of anti-Alices with black hair, not blonde, and all dressed in the reverse print to Alice’s dress. Adults, but likely not the children, will notice that this chorus is made up of both male and female actors. The chorus mainly function as stage assistants moving props about. Gerecke lends movement to the show by having most of the props delivered by bicycle or, in the case of the forest, actually being attached to bicycles. Except for Alice’s costume, Humpty Dumpty’s and Tweedledee and Tweedledum’s, Gerecke steers clear of the influence of the original illustrator John Tenniel. Her own brand of surrealism, seen in the billowing bright red gowns of the Red Queen and the high baroque wig of the White Queen, looks more to Fellini films for inspiration. One of Keiley and Gerecke’s best ideas is to stage the Jabberwocky poem as a puppet show so that children’s can at least watch the story unfold even if they don’t understand the nonsense words of Carroll’s narration. comic timing. One part of the action that most appealed to children, judging from their laughter, was the very beginning of the play when Lindström pretended to have a conversation with her cat Kitty. Kids loves the way she manipulated the stuffed animal as if it were real and pretended to argue with it. Throughout the rest of the play, Lindström could raise a laugh simply by staring with a confused expression out at the audience. Brian Tree followed the rule so necessary in farce and in absurdist drama of playing his role completely straight. The humour of listening to a talking egg is only highlighted when that egg speaks with such utter earnestness. Gerecke helped him by having two of the chorus visibly manipulate his two long arms, so that his control of his voice contrasted with his seeming lack of control over his arms. Some actors fell into the trap of thinking that they needed to cutesify they style to appeal to children by making funny faces, using funny walks and voices and bobbling their heads. Chief among these was Cynthia Dale as the Red Queen who destroyed whatever intimidating power that character might have had through all her added silliness. Dion Johnstone, surprisingly, followed the same line as the White King. 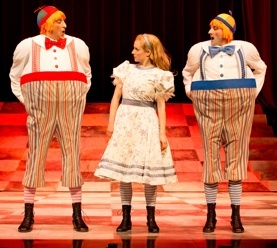 Other actors played their roles without embellishment like Sarah Orenstein as the permanently confused White Queen and Sanjay Talwar and Mike Nadajewski as Tweedledee and Tweedledum. Others seems at a loss as to what to do like Tom McCamus as the March Hare and Kevin Bundy as the Mad Hatter. Special mention, however, must be made of Elliott Loran, who, by playing his role so seriously, is hilarious as the know-it-all Gnat. Twice Keiley tries to involve the audience by dropping bell-pulls into the audience that have surprising effects when tugged. One time, a propos of nothing in the show, the cast run up and down the aisles strewing jelly beans. These incursions were so well received it made one think that Keiley ought to have gone further and refashioned Reaney’s script as a panto. There are so many occasions when Alice could ask the audience questions (e.g., “Where is Humpty Dumpty?” “He’s up there”) that doing so might keep them more engaged with the action. On the other hand, Jonathan Munro has provided so much music that one wonders why Keiley did not take that direction and simply turn Reaney’s script into a musical and give Dayna Tekatch more opportunities for choreography. As it is, Alice Through the Looking-Glass is not quite a musical and only makes a few gestures towards the panto. I attended the opening with a Grade 7 teacher who told me she spent the show counting the number of references that her students would not understand – with chess that underlies the whole structure of the story being the most crucial down to separate figures like the Lion and the Unicorn whose symbolism they would not know. Keiley and Gerecke have made the show as visually appealing as possible and even pull out the confetti canons, but, without dramatic conflict, it will only engage those who can spend two hours delighting in bright and shiny objects. Photos: (from top) Cast of Alice Through the Looking-Glass; Sanjay Talwar as Tweedledum, Trish Lindström as Alice and Mike nadajewski as Tweedledee; Brian Tree as Humpty Dumpty, Trish Lindström as Alice with Tom McCamus and Sarah Afful as Chorus. ©2014 Cylla von Tiedemann.